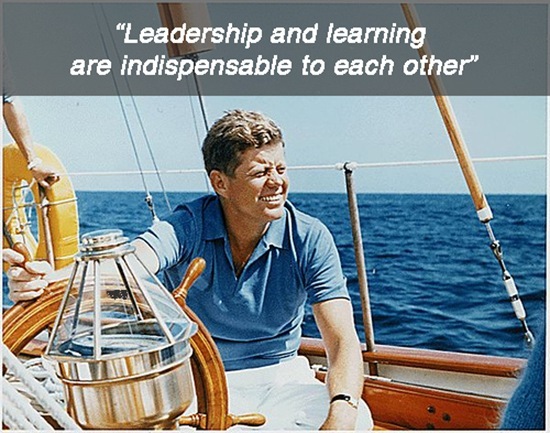 “Leadership and learning are indispensable to each other.” Those were words prepared for a speech to be delivered by President John F. Kennedy on November 22, 1963 the day on which he was assassinated. We believe that no truer words about Leadership have ever been written or spoken before or since. These words are what guide us in launching Weekly Leader, an online magazine about Leadership. With a Presidential election on the near horizon, a financial crisis of historic proportions brewing and a significant shift in international power underway, we believe that there has been no better time to launch a magazine that explores and discusses the concepts of Leadership. Justice Stewart could have easily been talking about Leadership. Several years ago, I had the great fortune to participate in an executive education program called The Leadership Journey: Creating and Developing Your Leadership at The Wharton School at the University of Pennsylvania. During the orientation session on the first evening, program co-director Michael Useem, The William and Jacalyn Egan Professor of Management and director of Center for Leadership and Change Management stated that the most effective leaders that he comes across in his work and research are those who are students of Leadership. We believe that the dispersed and diverse nature of information on the Internet in combination with the communication and discussion tools embodied in social media make a powerful platform for the exploration and discovery of Leadership. We also believe that there is and always will be an infinite supply of material from which to learn. While we have shared a few thoughts about we would like to accomplish here, the real direction of Weekly Leader will be determined by its readers and contributors. That’s you! So please comment on posts and send us feedback about Weekly Leader in general (contact form). We are diligently working on other ways for you to join in the conversation about Leadership in the future. And, we are eager to learn from you what would be most useful in your quest to develop your leadership. Last but certainly not least, please make sure that you subscribe to Weekly Leader so you can stay informed. In case you are unsure how to do this, we’ve created a simple User Guide here. Of course, you should always feel free to contact us. Thank you becoming part of the Weekly Leader community! Lead on! Tagged with John F. Kennedy, leadership, social media.